YoungWoong Jaejoong’s “Sunao ni Narenakute” will be broadcast in Korea through ‘Fashion N’. YoungWoong Jaejoong’s first Japanese drama! The newest hit Japanese hit drama in April 2010, “Sunao ni Narenakute” will be broadcast in Korea. First broadcast will be on the 9th of November (Tue) at 11pm. 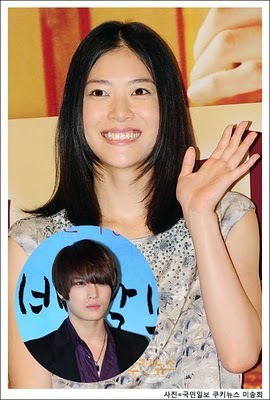 Japanese actress Ueno Juri talked about her impression of acting with Jaejoong in Fuji TV drama ‘Sunao ni narenakute’. Ueno Juri expressed her feelings to the reporters in Seoul Lotte Hotel in the morning of 3rd September that, ‘Whenever there are scenes in which Jaejoong has to hold my hand or carry me, his face will turn red and run to the back while making ‘aaaa…’ sound. He will hide behind the wall, so we didn’t interact that much. I even thought he hates me. Later when we become closer, and I asked him why he behaved that way, I was told that he deliberately kept a certain distance from me since he was acting as a character who likes me in the drama. Ueno Juri and Hero Jaejoong acted in the drama ‘Sunao ni narenakute’. The drama is about the process of a true friendship built among the people who met each other through network. Popular japanese actors including Eita were acting in this drama too. Awww… cute! JaeJoong must have felt embarrassed during the first days of filming where he had to act closely with Juri that’s why he often resorts to hiding or avoiding her. We all know how shy our JaeJoongie can be, right? LOL. and also, Jejung’s win of “Supporting Male Actor”. All the actors, all of them seemed to be praised highly. That is the happiest thing of all. Thinking he didn’t know, I was going to tell Jejung, but he already knew. He seemed very happy about it. The hugely popular hit drama [素直になれなくて], from the first chapter until the last, has been recorded into 6-disc DVD set! The actors include Eita, Ueno Juri, and Jejung as well as other popular casts!! *This is an image of the product, please note it may differ slightly from the actual product. *This postcard set is an original mu-mo limited special edition product. Jejung won absolute majority of votes for his best supporting actor 2010 14th Nikkan Sports Drama Grand Prix Spring Drama Season. Tohoshinki’s Jejung who plays male supporting role in Sunao ni Narenakute for the first time, wins with the absolute majority of votes. In the voting which started from 29/06 – 08/07 (total valid votes:15814), Jejung obtained more than half of the total votes, Sunao ni Narenakute also ranked no.1 in Best Drama section. There will be an annual voting in March next year for the first 5 nominees in every section. Four episodes were aired already? Wow, that was fast! ‘Sunao ni Narenakute’ will be broadcasted in LA and New York. There are no specific dates on the official site, but it is quite likely that broadcast has already started or will be starting this week. To have his drama broadcasted overseas is an invaluable opportunity, and we hope that Jaejoong’s skills as an actor will gain recognition. We hope that those of you in the US will offer constructive criticism and let us look forward to Jae’s charismatic peformance!